Are you tired of having to wait those few seconds after clicking "What have you got for sale?" until the actual barter menu (buy/sell menu) shows up? Do you find yourself spam-clicking your mouse to skip the dialogue when trying to sell loot? Then this mod is definitely for you! You may not use any of my assets provided in any of my mods to be sold for money, anywhere. Followers have now been added to this mod! The same result as with the merchants should be expected! If updating from a previous version, please make sure that you uninstall the previous version before installing version 2.0. All my mods will always be free. Ever since I started playing Skyrim, I have been bothered that you have to wait for the Merchant to finish talking before you can buy/sell loot. I found myself after a couple of hours of game-play spam-clicking my mouse to skip the dialogue after pressing the "What have you got for sale?" button, in order to skip some of it. I still did this without any exceptions before making this mod. I have been using this mod for quite a while now, and I am very happy with it. Vendors' and followers' inventory opens immediately after clicking "What have you got for sale? "/"I need to trade some things with you." instead of waiting until after the dialogue has finished. The barter menu (buy/sell menu) opens. Merchant says: "Trinkets, odds and ends. That sort of thing.". This mod should be compatible with almost all mods out there. The only thing I can think of where compatability would be an issue that is the mods that alter the same scripts as I alter in this mod. I have over 100 mods installed and do not have any issues with this what so ever. So you shouldn't be worried. 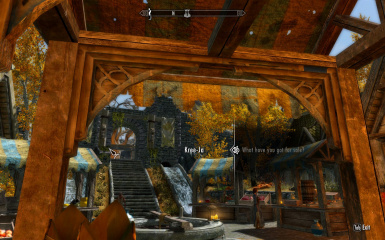 This mod currently affects the all merchants that use the vanilla Skyrim voice assets. I have confirmed that it works on the DLC Dragonborn where merchants use the same voices as in vanilla Skyrim. The mod will not affect any mod that adds new merchants that doesn't use the vanilla Barter Dialogue. I highly recommend installing this mod with the Nexus Mod Manager (NMM). Installation and uninstallation is far simpler with NMM. Load order will probably not be an issue, but just in case, use the BOSS masterlist. Extract "VendorSaleDelay-Gone.esp" into the Skyrim/data folder. Also extract all Scripts to Skyrim/data/scripts. Don't forget to actually activate the mod in the Skyrim pre-launcher, under "Data Files". Note: If you are updating from any previous version, please uninstall the mod completely, before installing the newest version. Current bugs: The stormcloak and imperial quartermasters say their quotes (i.e, "Heres what I can spare.") after exiting the barter menu, not before as intended. This is currently being looked at. If you installed via NMM, simply uncheck the mod from there. 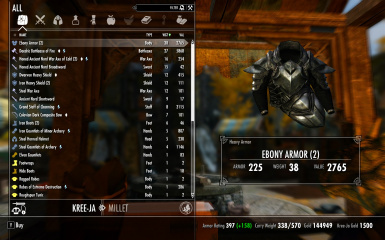 Remove VendorSaleDelay-Gone.esp from the Skyrim/data folder. Remove all the scritps that are included in the .rar file under Skyrim/data/scripts. This can be kind of a pain, since there are quite many. Heres a tip if you want to find all the scripts quickly: Sort the files by Date Created, and if you find one of the scripts my mod adds, for instance TIF__000A963A.pex, you should see a bunch of scripts that were created the very same time. These should be the files you want to remove. Remove all scripts that are named "VendorDelay********.pex", there should be 56 of them. v1.3: Fixed bug wherein the merchants LIPs would move, as if speaking, after exiting the barter menu. v1.3.1: Added Urag Gro-Shub (in College of Winterhold) to be compatible with the mod. - Added support for followers when trading equipment with them (all vanilla follower voice assets affected). - Added support for the Quartermasters in the Imperial and Stormcloak camps. - Renamed all scripts to "VendorDelay********.pex"
- Fixed a small issue where the merchants lips would keep moving as if speaking, after exiting the barter menu. - Fixed an issue where sitting down in a Tavern would yield improper results when approached by the waiter. Thank you for using my mod, and don't forget to endorse if you like it.